Heat the vegetable stock and add carrot and potatoes. Add chilli flakes and let it boil. Bring it to boil and simmer it for 10 minutes. Drain the vegetable and reserve the stock. Heat olive oil in pan and fry vegetables for 5 minutes. Pour back the reserved stock to vegetables and add tomatoes. Boil it for 5 minutes and add salt and pepper. Cool the mixture and blend it well for smooth paste. Serve the soup with salad onions,salt and pepper. 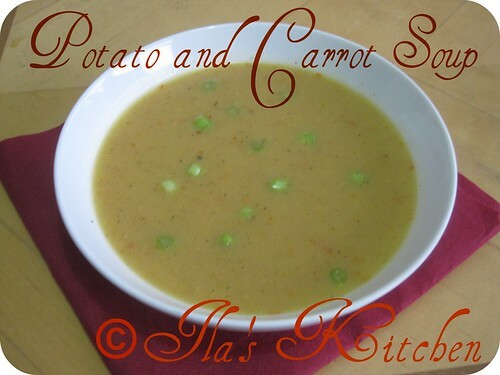 This yummy and healthy Potato and Carrot Soup can be served for dinner. wow soup looks so refreshing and wonderful !! I make it too. Simple and flavorful! Lovely healthy and delicious soup. Can have this soup even everyday, simply delicious..
Ila that was a wonderful marathon. Each soup was wonderful.Thanks to you now I have a collection of yummy soups. Potato carrot soup looks awesome delicious. nice and flavor filled soup ila.. I was away, looks like I missed many posts. Will catch up. Simple and delicious ... great job! Hearty, healthy and comforting bowl of soup. Delicious and filling soup...so healthy too. Ila, plz collect an award from my blog, which is for all my blogger friends. Soup looks so healthy and delicious dear.